The encouragement of a CBC kids’ show producer made my career a lot more fun. In Taddle Creek’s recent kids-themed issue (now on sale!) I profile a young guy named Cole who’s obsessed with subways, streetcars, and buses. Cole is eight this year, but his obsession dates back half a lifetime, to when he was only four. For whatever reason, something about public transit just clicked with him. When he was six Cole started grilling Joel Pinsk, one of the bus drivers on the route near Cole’s house, with his insatiable need to know how everything worked. Joel’s a very friendly and good-natured person, and he treated Cole’s enthusiasm seriously, answering all his questions. He even gave Cole some Toronto Transit Commission merchandise, including a union toque that seems to make Cole feel like a real T.T.C. insider. Thanks in part to Joel, at the age of eight Cole already has had some unique experiences. The astrophysicist Neil deGrasse Tyson tells a similar story of his relationship with Carl Sagan. When Tyson was applying to college, Sagan personally wrote him a letter inviting Tyson to tour his lab at Cornell. Sagan not only provided Tyson with a lot of encouragement that day, he also personally drove Tyson back to the bus station, giving him his home phone number and telling him to call if his bus ran into any trouble in the approaching snowstorm. Tyson said the experience made him realize what kind of person he wanted to be, and instilled in him a lifelong duty to give young scientists the same attention Sagan gave him. I’m proud to say I know firsthand how important these types of experiences can be to kids, because I’m a product of one myself. When I was ten years old, I became obsessed with a Sunday morning television show for kids on CBC called Switchback. There were many versions of the show broadcast across the country, but the one that reached my hometown of Saint John, New Brunswick, was the popular version based out of Halifax. Switchback was hosted by Stan “the Man” Johnson, and rounded out by a cast of humourously bizarre characters, including Rufus the dog (a stuffed Wrinkles puppet that didn’t move or talk but somehow was the show’s strongest personality), and “the Boss,” an off-screen authority figure who lived to torment Stan. The show was broadcast “hot and live” for ninety minutes every week, and featured call-ins, old movie serials, special guests, contests, and remote segments filmed at schools around the Maritimes. In many ways, Switchback harkened back to the golden age of live children’s television, creating a world that kids felt was just for them. In the fall of 1983, Stan and a crew visited my school of Forest Hills Elementary to film a bit with a Grade 6 class. That evening, Stan was scheduled to make an appearance at a nearby mall to sign autographs, so my friend John Hansen and I ventured down to say hi. Meeting the host of your favourite TV show is pretty thrilling for a ten year old. But even more thrilling for me was the conversation I struck up with a man standing nearby quietly overseeing the operation. As we talked, he revealed to me that he was the mysterious and always unseen “Boss”—in reality the show’s producer, John Nowlan. My mind was blown, and my Switchback fandom was cemented for life. I didn’t want to waste my newly found insider status, so I soon launched a Switchback fan club at Forest Hills, complete with membership cards and a handwritten newsletter—my first experience as an editor and publisher (and my first experience putting an inordinate amount of time into something few people read). I wrote John the Boss to fill him in, and soon after I received a huge envelope in the mail with the Switchback logo on it. Inside was a letter from John voicing his approval for my project, and asking me to be the show’s “Saint John voice.” He included some posters I could slap up around town, and some merchandise to hand out to fan club members however I saw fit. My club never amounted to much, but I kept John up to date on its progress on a regular basis nonetheless. I always knew that if I sent him a letter on a Monday after the show, there’d be a package waiting for me seven days later. Occasionally we’d even get to chat when I’d call in post-show for one reason or another and catch him manning a phone. My promotional efforts were no doubt negligible, but John still treated me as though I was an important part of the process, and that in turn made me feel pretty special and accomplished at a young age. I outgrew Switchback over time, and eventually the show got cancelled. But I never forgot John’s encouragement of my unusual, unlimited enthusiasm. Switchback’s spirit—not to mention its general vibe—lives on in Taddle Creek, something I don’t think I even was conscious of until recently. 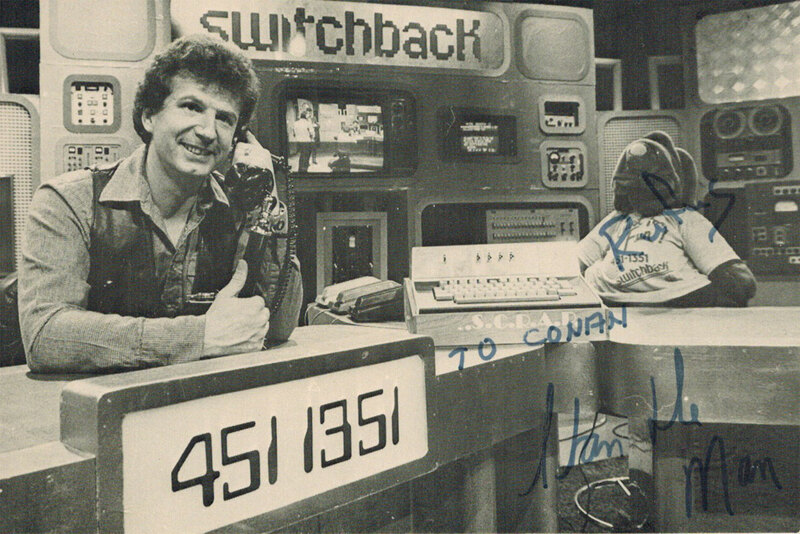 John had a lengthy career in television post-Switchback, most notably as the creator of the award-winning kids’ consumer-awareness show Street Cents. We hadn’t spoken in nearly thirty years until this past December, when I retrieved a voice mail from my work phone. The caller said his name was John Nowlan, and that he was a travel writer from Halifax with a story he’d like to pitch, and would I please call him back. I returned the call immediately and asked him if he was the John Nowlan, from CBC Television. He laughed and said, “Yes, I think so!” I asked him if he remembered me. It took him a second before his voice lit up and he said, “Oh! I though the name sounded familiar!” We chatted and caught up for half an hour. I finally was able to tell him I had a career in publishing, and never forgot that the very first thing I did was the Switchback Fan Club Newsletter. I promised to put a package in the mail for him of some of the things I’d been working on (something I’d been meaning to do for years), and we agreed to get together the next time we found ourselves in the same city. 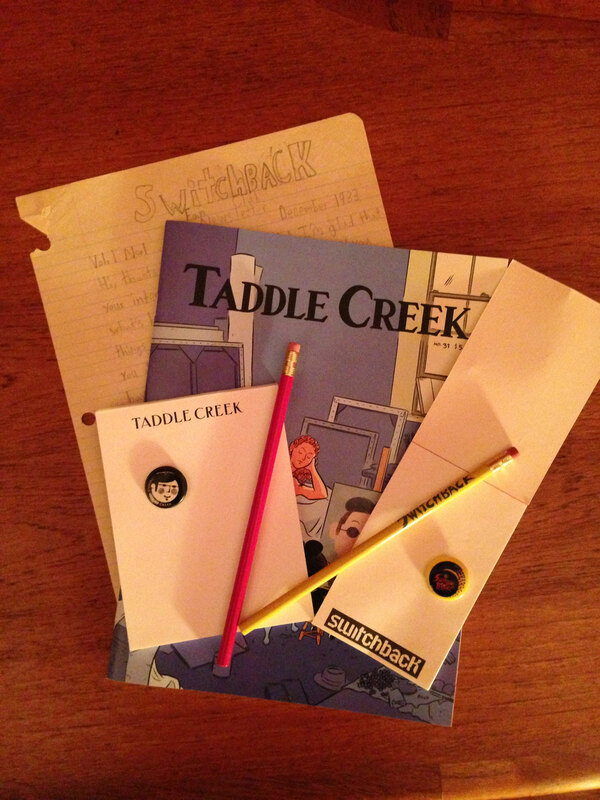 Switchback Fan Club Newsletter and show merchandise, 1983, and Taddle Creek magazine and merchandise, 2013. Tyson would have become a scientist without Sagan, and I would have gone into publishing without John, but I think the encouragement of our accidental mentors set our course in a slightly different, more fun direction. Even if Cole never grows up to be a bus driver or an engineer, I’m pretty sure the past four years will shape his life for the better in one way or another. I hope people like Joel and John understand the difference they make when they encourage kids with outside-the-box obsessions. I know that when a ten-year-old shows up at my office door with a strange love of publishing, I’ll do my part.